I had mentioned that about the current colours in my home, my dislike of them but the decision to keep them. And I was certain there’d be no painting involved. However, the yellow colour in my bedroom is driving me insane (and it seems like yellow rooms drive others crazy as well). Besides, I really want to get the green duvet from Brocade and it wouldn’t go well. I need paler, greener, walls. What makes your paint environmentally-friendly? VOCs (volatile organic compounds) are the solvents in most paints that evaporate and contribute to the depletion of the ozone. VOCs are also a part of the stinky odor in paint that is offensive and continues to off-gas which contributes to poor indoor air quality. YOLO Colorhouse® is formulated without the use of these solvents, as a result it is a 0 VOC and low odor, premium interior paint. What is Green Seal® Certified? Green Seal® is an independent non-profit setting standards for environmentally responsible products. Green Seal® certification is based on VOC content, the absence of chemicals (www.greenseal.org/standards/paints.htm), durability, performance and manufacturing practices. Green Seal® certification automatically qualifies YOLO Colorhouse® for LEED certified projects. Offering large colour swatches is such a great idea; I’ve ordered a few to test. I’ll let you know how it works out. 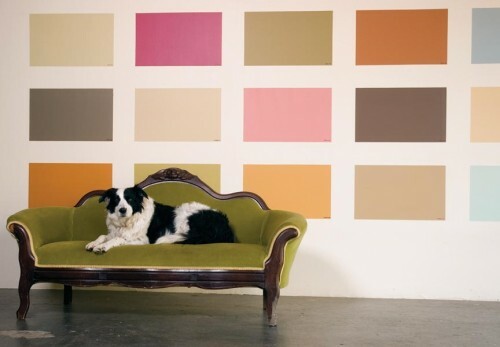 Farrow & Ball have free wallpaper samples; you can buy hand painted sample cards of their paint. They offer sample pots of paint so you can try the colour before buying a large can. Plus they are in Canada.